Is it that time of year again when you need to order Personal Cheques? Significantly reduce your costs by ordering online today! Standard delivery of personal cheques is 10 working days, Rush service is available which can reduce the delivery time to 3-5 days. Our Personal Cheques come in two standard cheque colors, Blue & Brown and are guaranteed to be fully compatible with all Canadian Banks, Credit Unions and Caisses Populaires including TD Canada Trust, RBC Royal Bank, Bank of Nova Scotia etc..
We can also print Personal Cheques for US Bank Accounts, however we can ONLY print them on the Business Style Manual or Business style laser cheques. If you are a Canadian with a US bank account or an American who has a Canadian bank account we can help! 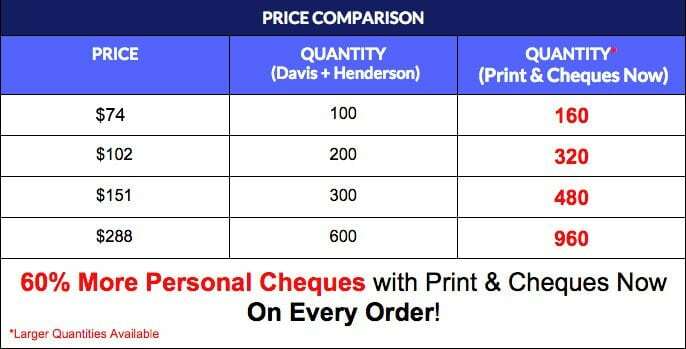 Order Personal Cheques online now by clicking here and receive 60% more Personal Cheques FREE on every order. ie. order 100 get 60 extra cheques at NO Cost! We match the banks national suppliers prices and then give you extra cheques to help you make your money stretch further! We guarantee our Personal Cheques to be 100% compatible with the Bank Cheques you order from your bank, but give you the benefit of stretching your money further at no additional cost from a Canadian Family owned and operating printing company! We use a High Security cheque paper that offers features to help reduce cheque fraud including Micro Printing, Warning Bands & Colored Cheque Backgrounds. Print & Cheques Now Inc can print Personal Bank Cheques for any bank account from any Canadian Bank or US Bank such as RBC/Royal Bank of Canada, CIBC/Canadian Imperial Bank of Commerce, BMO/Bank of Montreal, ScotiaBank/Bank of Nova Scotia, TD/Toronto-Dominion/TD Canada Trust, National Bank, Laurentian Bank, HSBC and more. We can also print personal cheques for all Credit Unions such as First Calgary, Servus Credit Union etc.. as well as Caisses Populaires accounts.